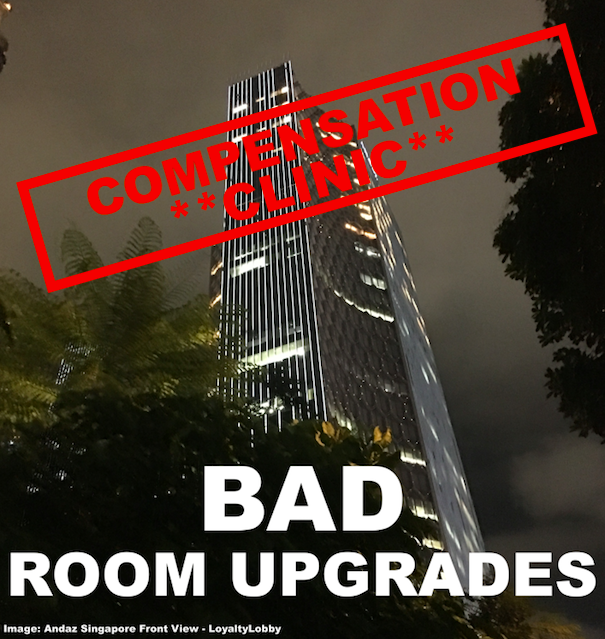 Our Compensation Clinic case this week stems from the Andaz Singapore where I recently had a 4-night stay that was plagued by a less than stellar experience. This is one of the properties that is gaming their upgrade inventory, not making the standard suite available but rather some studio suite while the regular rooms leave everything to be desired. As I wrote previously in a Whine Wednesday article this wasn’t my first stay at the Andaz Singapore and while my previous booking at that property was also associated with drama related to upgrades. However, I decided to give them another chance, staying for 4 nights this time again. As Globalist member of the World of Hyatt program the hotel is supposed to assign a suite upgrade, but this property is playing games and assigned their ‘Andaz Suite King’ as a premium suite. Instead, they classified their Studio Suite as the designated Standard Suite. The catch? It’s almost never available, not even on confirmed Globalist Suite Upgrade certificates. The breakfast, which is another status benefit, was already included in my rate so zero benefit was there as well. The room that was assigned was the same which a non-member colleague of mine received during the same week. Upon entering it was 37 degrees hot, damp and the tiny bathroom didn’t even have a tub. No welcome letter had been provided either. After returning from my trip I decided to contact Hyatt and file a complaint about this. The associate took down the information and promised that someone would be in tough within the next two days. He also offered 5000 points which I declined. Several days passed and nobody contacted me either via email or phone (I made sure both they had on file were correct). I then called again and said the waiting period is up and that nobody followed up on the service file as well as the promise to contact during the period given. The compensation I requested was one night worth of Hyatt points (25,000). Considering this was a 4 nights prepaid rate of US$300 per night the compensation is more than reasonable. I eventually moved to the Intercontinental close by because the room was just horrible. Sadly there are many hotels that just don’t provide proper upgrades to the elite members of the associated loyalty program. Others even go so far as to specifically modify their Standard Suite upgrade inventory to get around the rules and I think it’s important that those properties get called out either way. The key is how hotels handle this inventory and playing games with category designation is definitely foul play. This was the last time for me that I booked Andaz Singapore. The Grand Hyatt there is pretty good and I will book that one or another property related to my memberships in the future. Next articleHilton Honors My Offers – 5,000 Bonus Points For A Stay?